The rides back and forth from Tennessee to Texas were long, and on many of those trips, our Grandmother would pick us up or drop us off. She and my grandfather were heavy smokers, and when they drove us on long trips, I spent a lot of time on the floorboard of the back seat trying not to suffocate from second-hand smoke. Somehow, both Grandma and Grandpa believed that smoking was only enhanced if the windows were rolled UP, when you lit up! Yep, Grandma and Grandpa were serious smokers. Grandma smoked Vantage Menthol 100′s and Grandpa smoked L&M Golds, also 100′s. After all, the only thing better than a cigarette is a long one, right?!?!? I’d guess that they each smoked close to two packs a day at their peak. That’s one every 24 minutes, folks. Try it sometime, and you’ll feel like you’ve gone to hell – and smell like it, too! We begged them to quit for a long time, and eventually Grandma did quit, when my sister told her that she couldn’t smoke around her first born. Grandpa, who smoked where he pleased, when he pleased, was even relegated to the back-yard when he wanted to smoke after that first great-grandchild came along. On our last trip down memory lane, we were in Jefferson, Texas at the Hamburger store. Next up in among my favorite memories of yesteryear travels are the ‘Wonderland of Lights’ in Marshall, Texas. Like Jefferson, Marshall is a small town along US 59. In the mid-1980′s, Marshall city leaders worked to increase economic activity in the area and eventually came up with a plan to hold a Christmas light festival, now known as the ‘Wonderland of Lights’. This festival is held annually, beginning around Thanksgiving through Christmas and boasts ALOT of Christmas lights, and brings ALOT of people to this otherwise, fairly small, unassuming east Texas town. 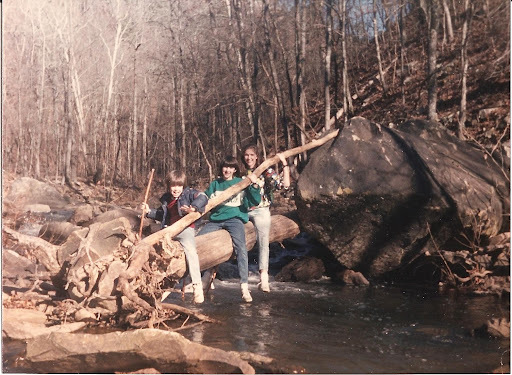 Way back in the early to mid-1980′s, my sisters and I were indoctrinated to hiking and camping by our dad, during our summer and winter stays with him. My parents were divorced in the late 70′s, and we kids spent alot of time during school breaks commuting on the highways and byways between home (Tennessee) and home away from home (Texas). I was a backseat passenger on more boring rides through Texarkana than I could even venture to recall. But those rides also brought a lot of special memories for my sisters and I.
Dr. Bronner’s Magic Soap. The name says it all, huh? In my very first blog post about gear, I thought I would list the one product that I use every day, camping or no. According to the bottle, you only need two cosmetics: Dr. Bronner’s and enough sleep. This soap is so versatile that I’m going to give it it’s own category and teach you the things that you can do with it. Isn’t that exciting?!?! I was introduced to Dr. B’s by my dad. I don’t know when he first started using it around the house, but I’ve been around this stuff since I was at least ten, if not before. It was always by the kitchen sink, and NEVER left behind on a camping trip. I remember getting it as a Christmas present several times. I used to think that was pretty weird, but I guess my dad was just forward thinking. Today, I would JUMP WITH JOY at receiving Dr. B’s as a present. Like with camping, I had a hiatus from Dr. B’s for about 15 years. About a year ago I saw some in a store, opened the bottle and took a whiff. As the memories came rushing back, I suppose I knew I was hooked. There are some things that cannot be genetically denied, and this is definitely one of them. Counting my dad, myself, and of course Joe, we have three generations of Dr. Bronner users! Today I was talking to my dad about my addiction to the stuff, and he said there are worse things to be obsessed with, which I guess is true. Much better than “pills and 90 proof”, as Hank once said. I wonder if there is a 12 step program for highly concentrated peppermint soap addicts, LOL. Why campingwithjoe.net? Some of my favorite memories revolve around camping with my dad and sisters, the Boy Scouts, and with friends in high school and college. From ages 7 to about 20, I went camping at least once or twice a year, some years it was many more. Most of my camping trips were in Arkansas, Tennessee, and Missouri. I’ve never been to any of the big parks, but am getting an idea that it may be something to work up to. Anyway, for one reason or another, I’ve had a near 15 year hiatus from the great outdoors, and I’m itching to get back. Now that Joe is five, I figured he’d be game to try out camping. I asked him about it, and of course, he is “all in”, as they say on the plains. Once the wheels started churning, I realized that camping, like it did with my dad and I, could open up a lot of opportunities for Joe and I to bond. So, I started plotting and scheming, as dads will do, and eventually the idea came to me that it would be cool to chronicle our adventures together on a website/blog.